Quebec’s “Charter of Values” has elicited a great deal of discussion since it was first introduced by the Parti Québécois in the Fall of 2013. 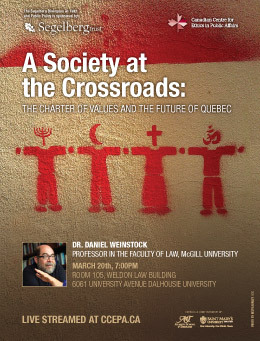 In this lecture, Daniel Weinstock will elucidate both the political context in which the proposed law has emerged, and the deeper intellectual and social context in which it is rooted. 7 – 9 pm, Room 105, Weldon Law Building, Dalhousie University. This lecture will also be streamed live at http://www.ccepa.ca/.